Mike Ullery | Miami Valley Today Miami County Sheriff’s Deputies investigate a single-vehicle crash on St. Rt. 202, near Ebberts Road on Thursday evening. TROY — Miami County Sheriff’s Deputies are investigating a crash on St. Rt. 202 that led to a driver being trapped in their overturned car in high water on Thursday. The crash was reported just after 8 p.m. 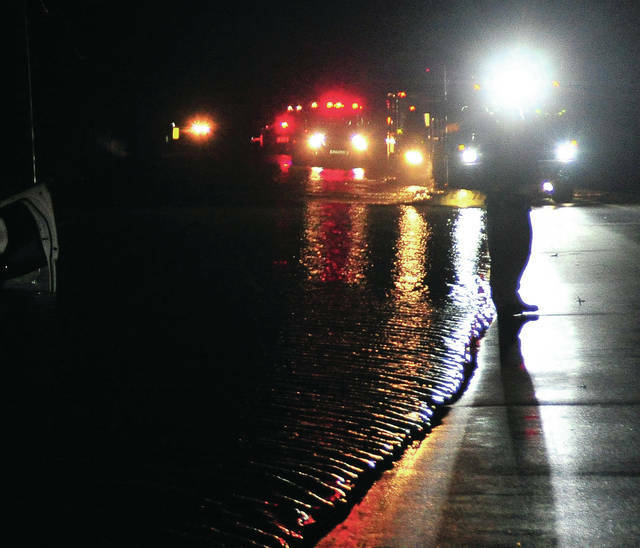 The caller to Miami County 911 reported that a car was overturned in high water and the occupant was submerged. Troy Fire Department and medics responded to the scene near Ebberts Road. One victim was transported from the scene by Troy Fire Department medics and taken to Upper Valley Medical Center. A crash reconstruction team was enroute to the scene to begin piecing together what led to the crash. St. Rt. 202 is closed between Ebberts Road and St. Rt. 571 while the crash is being investigated. https://www.dailycall.com/wp-content/uploads/sites/30/2019/02/web1_020719mju_crash_sr202_fatal-1.jpgMike Ullery | Miami Valley Today Miami County Sheriff’s Deputies investigate a single-vehicle crash on St. Rt. 202, near Ebberts Road on Thursday evening.